"What's the rush? are you in a hurry to get old?" Fast and Furious or Slow and Serene? It's a choice determined by our personalities, our moods, or perhaps by necessity. The important part is that it is a choice. -----We all love to categorize each other, and ourselves. Ordinarily, our simple minds like to think in 'twos.' This conveniently divides anything complex into two neat piles. We are 'Either' or 'Or.' Then the generalizations and myths take over. We are then individually given the known characteristics of our group. If I say Texan, what comes to mind? See? How about New Yorker? Ah hah! However, down underneath our generalities, we know reality - every Texan is unique, and as different from each other as from New Yorkers. -----It's true, of course, boaters can be neatly divided into two. There are those who potter about under sail and those who chug along under power, but since we're in the vein of dividing folks, I would propose a different division: fast or slow. The immutable laws of physics dictate this partition. Your hull either skims along on the top of the water or it lumbers along deep in the water pushing the fluid aside. Skimmers are fast; Displacers are slow. -----This automatically puts most sailors into the slow category, since most ride on displacement hulls. Life is generally lived at a leisurely seven knots, or less. The longer the hull (or the more the hulls), the faster you might go. But, still, fifteen knots is hardly 'burning up the pond'. Oh, I know, there are a few exceptions. We once owned a sailboat in the general class called 'scow.' Sounds slow, right? "Just an old scow." Well, when we came flying into the dock (the boat was a Y-Flyer), power-boaters would walk by and sneak a look at our stern trying to find a prop. It was that rarity among sailboats - a Skimmer. -----Powerboats are more complex. They are all Displacers at slow speed, and plow along through the water. But, with increasing speed, they themselves divide into Skimmers or Displacers. -----It all depends on hull design. The Skimmers are generally flat-bottomed so they can plane along atop the water given enough speed. They wallow along at slow speed, but as they accelerate, they lift up onto the water surface and 'go on plane.' 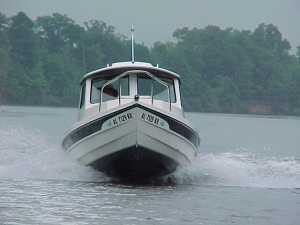 Cigarette boats are the classic skimming boat, but then, so is a C-Dory above 10 or 11 knots. -----The Displacers, with a different hull design or insufficient power, can never skim. Put in a bigger and bigger engine and the result is another knot or two of speed and an ever-larger wave of displaced water. This is frightfully fuel inefficient, since most of that power is, by the laws of physics, forced into making a big wave. Trawlers are the classic displacement boat. -----That said, it is obvious that the mode of power (sail or engine) is not what separates us boaters, but our speed. And there lies the distinction. There are those of us who like to live fast and those who prefer the slow lane. -----Sailors like to potter along, yanking on lines and heeling with the breezes. Of course, if the wind dies, most quickly turn on the 'iron jenny' and become (admit it!) power boaters. Trawlers, often with an ex-sailor at the helm, also enjoy poking along, but without the exertion or bother of all those sails and lines. It takes a certain type of person to contentedly dawdle along through life, displacing water. -----We were cruising south along the Tennessee when we received an anxious call on the VHF from a sailor we had passed and chatted with a half-hour earlier. He was aground and wondered if we would help. Seems he was happily pottering along, reading a book, and ran into the shore! After helping him off, we continued on. 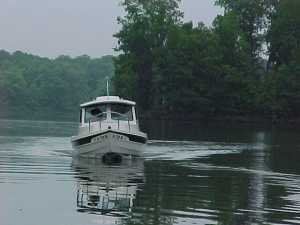 -----That evening, in a cove on Kentucky Lake, we were having our sundowners in the cockpit, when we heard that most menacing of boating sounds - five long blasts. Out on the lake was our sailor friend, drifting along in light air, and bearing down on him was a gigantic tow. The tow captain was shouting obscenities into the VHF and repeated his five long bellows. The sailor's head popped up from the cabin, stared at the menace of a zillion tons of steel and coal bearing down on him, and quickly changed course. The tow missed him by mere feet. The tow skipper, still filling Ch. 16 with his opinion of 'pleasure boaters,' was outside his cabin waving his arms in gestures unmistakable even at our distance. When the sailor came into our cove and anchored near us, we asked him, "What happened?" He replied that since it was so calm, he had gone below to rewire his (turned-off) radio, and lost track of time. 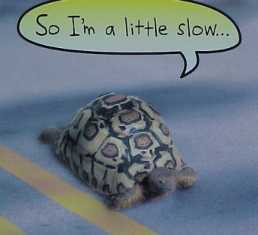 Some like the slow lane. -----Equally as menacing to themselves and others are those few displacement-hull power boaters who just don't get it. Those who play the lottery are described as being statistically-challenged. They just don't get the laws of mathematics. There are boaters who are physics-challenged. They don't get the laws of physics. They buy a displacement hull and let the salesman sell them a mega-horsepower engine. Now if your experience is cars, not boats, and you think the more the horsepower in your car, the faster the speed (or so Detroit would have us believe), then you think the bigger your boat's engine the faster you go. Those poor souls burn more fuel getting off the dock than we use in a week of cruising. They are displaced skimmers. -----We met one of those in North Carolina's Alligator-Pungo Canal. We were northbound in the long narrow canal when the VHF blared a warning - "Southbound Sportfish pushing a huge wake - almost swamped us." The VHF continued blaring expletive deleted messages from cruisers rocked by the displaced skimmer roaring down the canal leaving a huge wake. He was rolling everyone and causing interior damage to cabins and equipment. Frantic calls went out to the Coast Guard to stop the guy. But a local fisherman did it first. After his small fishing punt was swamped by the wake of that huge displacement hull, the local swam to his pickup, drove rapidly south beside the canal and parked behind some brush. As the huge white Sportfish approached, leaving a wake that would do the North Shore of Oahu proud, the local hauled out his shotgun from the back seat and patiently waited. The next calls on the VHF were from the Sportfish - "Mayday! Mayday! Some madman just shot holes in my hull - I'm sinking." Needless to say, there was not a single response to his call. Our cruising friends passed by the swamped boat piled up on the shore shortly after the incident. The guy aboard waved frantically at them, and, continuing on, they blithely waved back. -----The real Skimmers are another personality type. Life 'in the fast lane,' wind through the hair, power at the throttle - yeee haaah! Their wakes are seldom a problem (often less than from sailboats), since they displace so little water. Their menace comes from their speed. -----We lost a friend, a young man who babysat for our children, on Lake Mead. He was a passenger in a cigarette boat skimming at high speed when they crossed a wake and went airborne. The boat landed upside down and disintegrated. They never found his body, or most of the boat. -----Skimmers can also be a hazard to others, if they are irresponsible. Last summer, on the Trent/Severn canal, in Ontario, we heard via the VHF grapevine about a fatal accident the night before. Some young guys, in their high-speed skimmer, with no running lights, had plowed broadside into a couple night-fishing in their rowboat. They were still searching for bodies. -----When cruising through open water, in good weather, we usually skim our C-Dory at about 12-15 knots. Our engines are efficient, we are 'gitting along,' and we have good steering control. We also skim when we see or hear of an approaching storm and we want to get into harbor. We skim in the evening to get to harbor, with darkness approaching. There are many other delightful hours, however, when we creep along at 5 knots. The twilight hours on a northern lake when the deer are coming to the lakeshore for a drink shouldn't be rushed. Nor should the early morning hours along the winding, twisting meanders of a southern stream, with turtles, egrets, and alligators sunning along the banks. -----The C-Dory proves, once again, to be the perfect boat for us. We have the right vehicle to move along on the freeways of the water world - and can just as easily mosey along on the back waters.